Howard Webb sent this photo postcard, adding it's 'really badly faded real photo postcard of Windmill Road, I've edited it the best I can. C1905?'. 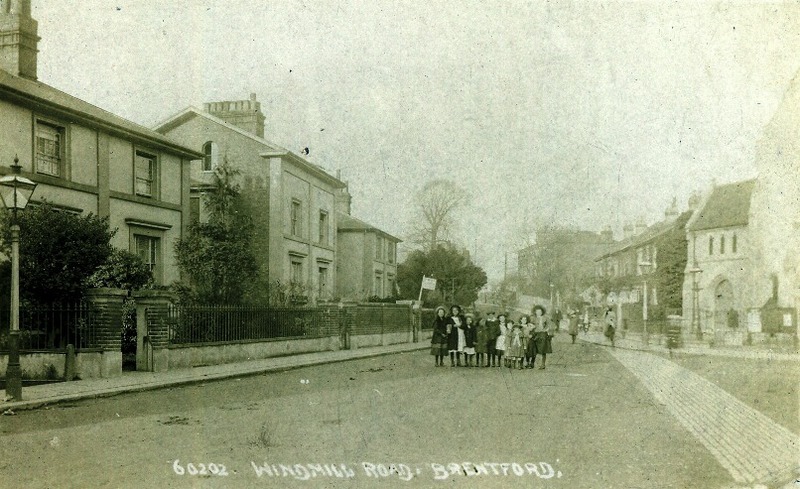 The photographer was standing at the junction of Clifden Road and Windmill Road, looking north and facing the Methodist chapel, part of which is visible on the right. The slight rise in the road in the distance is the bridge over the London and South Western Railway: Brentford Station is a little to the left. Hamilton Road is to the right between the photographer and the bridge. A group of ten schoolchildren have been included in the centre of what was then a quiet road. See a view taken from nearby looking in the same direction.